The annual BEDFORD GARDEN FESTIVAL - 19-21 October 2018 is an Eastern Cape midlands country lifestyle adventure that attracts visitors from all over South Africa. Since the first festival was held in 2004 (14 years ago) a loyal supporter base has developed with many people returning year after year for their date with spring in the countryside.For three days gardeners and nature-loving families will explore our country roads, discovering our magnificent farm gardens and making new friends. Come to Bedford for more open gardens, plant nurseries, two market hubs, lots of shopping, live music, warm hospitality and the scrumptious food we are known for. Bedford’s flagship gardens are all situated on farms. For 2018, ten are opening, many of them historic: Eildon, Belmont, Glen Ross, Skelmkloof, De Klerksdal, Albertvale, Maasström, Cavers, Glen Gregor, Donkerhoek. 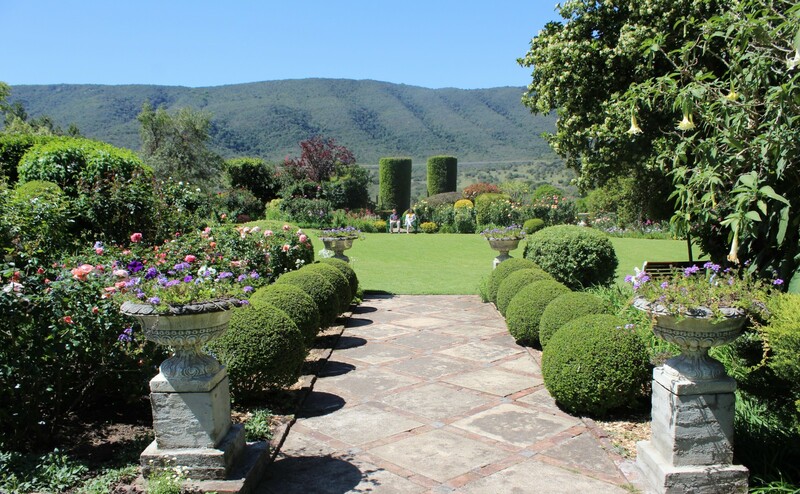 Lunches will be available in the gardens at Eildon (cheese and wine lunches), Skelmkloof (traditional vetkoek with kerrie mince etc), Lynedoch (there is no garden but they will serve traditional vetkoek with mince, cheese and/or jam), De Klerksdal (light lunch), Albertvale (wagyu and/or halloumi burgers with garden salads), Cavers (pulled pork or lamb on roosterbrood with coleslaw). Tea/coffee and home-made lemon cordial are on tap at many farms and the cream scones at Donkerhoek are legendary. Norwood farm will once again present sundowners and sosaties to round off the day’s excitement. In town there is plenty of diversion. Visitors and locals have ample opportunity to network at our two market hubs – Homeground at The Duke of Bedford Inn (food, drinks, craft beer, exhibitions, all garden related stalls and sales) and the Country Market at the NGKerk hall and grounds (fast food, crafts etc). Both precincts are child friendly. Floral arrangements and locally made quilts will be on show at the Presbyterian church and the powerful Templeton High School choir will sing in the NGKerk on Saturday 20 October. There are also several very special open gardens. The SA Rosarium is a national collection and information centre for old roses. The Long Garden is sure to attract a lot of attention again: it includes an African interpretation of a prairie garden designed by Franchesca Watson. The Garden Festival is a touring adventure. With our comprehensive map you will discover stunning scenery on quiet country roads, visiting open gardens en route. Meet the gardeners and pick their brains – local know-how is based on generations of experience. Download the programme, which includes itineraries and various garden route maps or collect a printed programme when you arrive. Then follow the suggested itineraries, or create your own, for a day out exploring the country roads and our exciting mountains and farm gardens. "Don`t miss this unique experience.........beautiful gardens, lovely vibe and the best hospitality you will ever experience!" "Fantastic garden festival! Each year is better than the last"